I am always interested to receive feedback from people who attend one of my talks, workshops or holidays. The following represents a selection of the comments I have received which specifically relate to my Crocodiles of the World photo workshop. Crocodiles are some of the most feared and yet revered predators on the planet. Photographing them is a real privilege but extremely difficult without travelling to the exotic locations where they live. I have joined forces with Shaun Foggett the owner of Britain's first and only crocodile zoo to provide probably the very best opportunities to photograph these exceptional creatures in the UK. 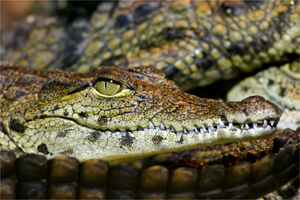 Nowhere else do you have the opportunity to see such a wide collection of crocodiles, alligators and caimans. The zoo houses over 100 individuals representing more than 14 species including a Nile crocodiles, American alligators, extremely rare Siamese and Cuban Crocodiles and black caiman. These range from newly hatched babies to 3m long giants. All are housed in purposed built enclosures with large water and equally large land areas. The water areas have glass fronts providing excellent opportunities for underwater viewing and photography. By special arrangement we enter the enclosures with some species including the massive 3 meter American Alligators to achieve some awe inspiring shots with these magnificent reptiles just feet away from you. 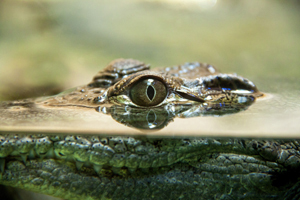 We also photography baby crocodilians in a special set under artificial lights and if available crocodile eggs. Feed back received from attendees of this workshop.